Update 0.8.18 for Shoujo City 3D with redesigned Summer Town location is released on Steam and Google Play. iOS update is coming soon (hopefully). The map was redesigned to make it more realistic and detailed. The beach area is removed and replaced with a new lazy river and several pools. Floating objects placed in the river will float along its path. You can sit on any single and double swim ring, inflatable dolphin (which now can be carried and dropped), when they are placed on any water surface. Swim rings now can be controlled and used to swim in any direction. Water slides have new sounds and additional water animation. New 3D models: deckchairs, passages over the river, rocks, sign boards, wooden platforms, mushroom pool fountain, cafe tables, administrative buildings, and a few smaller objects. Maid dress and maid headband (sold in the clothes store). Seashells that formerly could be collected in the Summer Town map now will spawn in the shrine map instead. Additional interior details and improved textures for the Neko Cafe. Waitress NPC will now greet you when you enter cafe. Fixed a small issue with incorrect placement of ice cream and kakigoori in hands. Characters now will look at food (on table) while eating. Improved weight painting for long and mini skirts. Now you can earn additional 5,000 Yen per day by taking part-time job in the Shinto shrine map. The task is to sweep all fallen leaves on the shrine grounds. Required items: broom (can be obtained for free on the part-time job spot) and miko dress (can be bought in the shrine shop). Broom is operated the same way as tennis racket/water gun. All dating activities (and other actions affecting your skills) now deplete a new “stamina” stat of your character, which is used to limit amount of available actions per day. Stamina is restored only by sleeping and proceeding to next day. All dating activities now have an infobox showing reqiured amount of stamina and affected stats. All Summer Town rides are now classified as full dating activities and affect stats accordingly. Omamori and omikuji now work differently: positive charms will prevent corresponding skills from decreasing and add +1 bonus point on top of what you gained through skill increase. Negative charms will cancel gained skill increase and additionally decrease corresponding skill by 1 point. Love omamori/omikuji now don’t affect relationship score directly, but affect instead a new “social” skill, which goes up or down after each conversation date. Money omamori/omikuji are not changed and work the same as before: they decrease or increase prices in all shops and don’t affect any character stats. A new sports omamori (affecting “sports” skill of your character) is available in the jinja map. Fixed a small issue with walking outside of school map limits. New road signs in apartment, school, and Summer Town maps. More accurate rain detection (for girlfriend). Pillow now also declines outdoors activities during rain. Money tab is now hidden by default and shown only in inventory/shops/status screen. Your character’s status window now can be accessed through a cogwheel button in the top-left screen corner instead of the in-game smartphone. Fixed a minor issue with NPCs occasionally pushing characters during dates. Fixed a minor bug for kissing mini-game (when played without pocky). There were no major updates for Shoujo City 3D in a few months, so I wanted to show a small preview of what I’m currently working on. This is how a new Akihabara map currently looks like (50% complete as of December 2018). It will be released in the first half of 2019. There are no outsourced or store-bought assets in this map, all 3D models and textures are created from a scratch by me personally, so it will take a while as yet to prepare everything required (and that’s why there were no major updates in a while). Most people who asked to add males didn’t want as much to play as males, but rather wanted to have an option to date males. This is by far more complex feature to implement (compared to just choosing to play as a girl or a boy) and would require not only new assets for characters and clothes, but deep reworking of many game mechanics, animations, dialogues, and gameplay ideas. Realistically speaking, full implementation of “play as a boy” feature would extend game development time by about one year, and full implementation of all gender dating options (girl x girl, girl x boy, boy x girl, boy x boy – that’s what most actually asked for) would require about two more years of work on top of what is planned already. So the final game would be released in 2022 instead of 2020, at best. I don’t think I can keep people interested enough to actively follow development of this project for that long. This game is quite an ambitious project for one person already, and since it never gained any wide popularity and recognition after initial release, there isn’t any chance already that at some point in the future it becomes popular and profitable enough to expand development team. Whatever development goals I set, I will be the only person to carry them out, so I should concentrate on what realistically can be achieved by one person. Otherwise there would be a high probability that this game joins the vast mass of “good concept, never properly executed” other Early Access games with ever slowing down development progress and ever dropping interest from players. And never finished. Long story short, I think it’s much better to have a complete game with smaller scope than to keep dragging development for years and risk having it never finished. Adding NPCs in all areas with different behavior and more interaction options with NPCs. Improving girlfriend’s AI and behavior patterns so she acts more realistic. Adding more interaction options with one’s girlfriend (including school clubs). Most importantly, building clear and logical gameplay based on improving one’s skills and completing dating activities, so that players have real goals to achieve throughout gameplay and can finish the game. While the game visuals improved a lot compared to the first alpha release in 2017, gameplay didn’t do the same progress. That needs to be worked on. The final version of the game is scheduled for release for summer of 2020 (hopefully). Finally, I want to thank all people who decided to support this project by buying Steam (or premium mobile) version of the game. Every purchase is a direct contribution towards the future of this project. It is alive and keeps developing thanks to you. 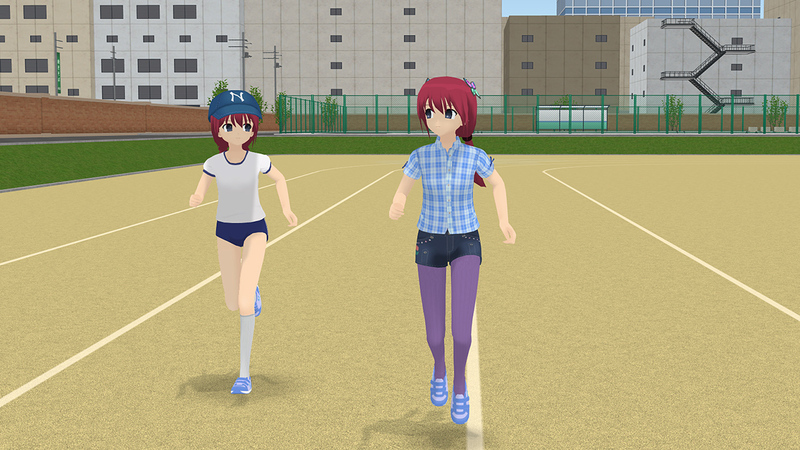 Version 0.8.13 of Shoujo City 3D is released on Steam, the App Store, and Google Play. “Bench kissing” feature is also included into updated free demo for PC (version 0.6.7). In addition to kissing while standing and sitting on the ground, now it’s also possible to kiss while sitting on benches. When your girlfriend is in a mood for a kiss, sit on any bench and wait until she moves closer to you. After that, press action button to start the pocky/kissing mini-game. If you date a pillow, sit on a bench with pillow in hands to start the mini-game. The pocky/kissing game has a new selection menu. Now you don’t have to place a pack of pocky in hands to play the pocky game. Instead, when you use action button on your girlfriend, there will be a new menu to choose between pocky game (if you have pocky in your inventory) and direct kiss (unlocked after level 50 for girl, and available at any level for pillow). Pillow doesn’t have an option for pocky game, only for direct kiss. Improved textures for sand, some floors, grass, fences. Fixed several minor weight painting issues for shirts and dresses, clipping issue for tall boots (when used with tights). Old boots will be unusable after this update, so if you had them in inventory, put them into recycle bin, and buy new boots. Two equipment slots for underwear, and all underwear (including swimsuits) formerly sold in the game, are removed. “Shirt” and “skirt” equipment slots are locked, so clothes in these slots now can be only swapped with other items, but not removed. The game was renamed from “Shoujo City 3D” to “Anime City 3D”. The game now has 17+ rating on the App Store, but even with that rating, you’ll have to ride water slides fully clothed, since girls wearing swimsuits at a water park was considered too offensive and objectionable, apparently. Oh well, at least they didn’t force to dress all girls into non-removable burqa or something. Maybe that will be their next request, though. All these changes (apart from the title) were also introduced to Android version of the game. I’m not really happy with these changes, but I didn’t have any choice, actually. All versions of the game (PC, iOS and Android) now are at the same version 0.8.12. Steam and Android version of Shoujo City 3D are updated to version 0.8.12. All updates for iOS version are still rejected by the App Store, and at this point it’s impossible to predict when iOS updates will be resumed. Christmas decorations in all locations. In addition to squirrels, seashells and pine cones now can be exchanged for money at Shoujo Mart. Improved textures for various road and building elements in all maps (pavements, railings, stairs, utility poles, pillars, floors). Fixed an issue that didn’t allow to cancel a Ferris wheel ride if you had a water gun or swim ring in hands.